My first post in awhile. Since I last wrote I’ve had six weeks of busy teaching – I taught three courses on the Oxford Experience – British Popular Music 1963-73 excluding the Beatles, Symbolist to Modernist 1880-1930 which includes Sibelius and Nielsen, and the Battle of Britain; I also taught a three-week version of Symbolist to Modernist which gave me time to look at some Modernist texts and music, bringing in Stravinsky, for example. With my friend Roger Dalrymple I also played two sets of guitar songs for the Oxford Experience. My book Chord Master’s revised edition is now out. Among the revisions were an expansion of the musical examples for the benefit of beginners. This came out of my guitar teaching experience, where I have noted that not everyone can manage standard open chord shapes which we take for granted. I look forward to seeing the new Beatles’ film Eight Days A Week, especially as I will be teaching my course on the Beatles at the Oxford Experience in 2017. I’ve been enjoying a double CD (Brilliant Classics 95221) of classical guitar pieces by the Polish composer Alexander Tansman (1897-1986). His music has been recorded more in the past fifteen years or so and I discovered him via his symphonies on Chandos, especially no 7 which is close to Stravinsky’s sound-world albeit with a slightly lighter and more lyrical aspect. The guitar pieces sound very fresh and full of strong melodies and interesting harmonies. During the period from April to mid-June I spent much time preparing three albums of songs for release. This comprises some 54 songs. I was interrupted in finishing the artwork for the covers by the summer school teaching. 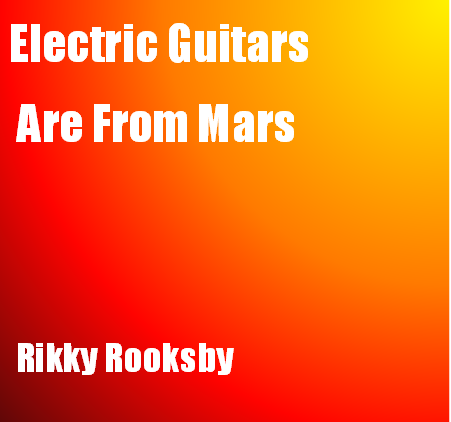 One of the tracks ‘Rock-Ola Rainbow’ will be available at amazon.com in a few weeks. This entry was posted on September 7, 2016 by rikkyrooksby. It was filed under Uncategorized and was tagged with Chord Master, Electric Guitars Are From Mars, Tansman. Well done Rikki, I loved your Beatles annotation and the Catatonia.